Scooter luggage bags – Why Carry Your Bag If You Can Scoot? This sounds like a lot fun right? Scooter luggage bags – this is sure to bring back childhood memories. And the good news is that different versions are not only available for kids, but for adults and the young at heart as well. Now it’s basically your choice which one you prefer – the traditional kick-scooter or electric one? Read more about the world of scooter luggage and find out what exactly it is, what is available and where to get the latest scooter luggage and also scooter luggage helmets for the kids. What Is A Scooter Luggage Bag? A scooter luggage bag is basically a two-in-one deal you get. A carry-on sized luggage bag PLUS a scooter. 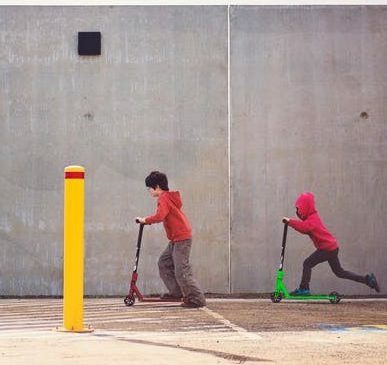 There are different versions out for different ages, kids luggage scooters are the more traditional kick-scooters, whereas the adult versions tend to be either kick or electric ones. Many times the luggage easily converts from a simple carry-on to either the three-wheeled kick-scooter version or the electric stand-up scooter. Of course the luggage part is still fully functional and doesn’t decrease in size either. Usually you can take off the bag part and use it by itself as well as with the scooter. The kick-scooter type of luggage has been around for quite a while, but the electric scooter luggage will see a lot of new customers in the coming years. It’ll just make it so much easier (and fun!) to get around the airport quickly. Please refer to the manufacturer’s or seller’s guide in terms of capacity, size and age recommendation, as they all differ. –>>Click on image to check price. Maximum user weight is 120kg, adults only. Three inner compartments for sorting and keeping things separate. Read more about the many other designs available from Sondre. Not quite a scooter, but we thought we’d quickly include a video about the Modobag, as it’s a pretty neat way to get around the airport too: The Modobag is a carry-on sized piece of luggage, which can be used as an electric ride-on for adults! What are your thoughts on the currently available scooter luggage options? Please let us know your comments, thoughts or questions and we will get back to you in no time. Bags And Suitcases is a participant in the Amazon Services LLC Associates Program, an affiliate advertising program designed to provide a means for sites to earn advertising fees by advertising and linking to Amazon.com. This is at no extra cost to you. Yes, indeed this looks like a ton of fun. Scooter luggage bags! I travel a few times per year and this stuff could be a lifesaver 🙂 Thank you for the information. All the best. What a clever idea! Didn’t know these existed. Certainly comes in handy when there’s very little time during a layover, and the departing gate is on the opposite end of the airport from the arrival gate! Oh my gosh, I would love something like this! What a fun way to get around! I have never heard of these before and I am so glad I know about them now! I know right! Well, the ones I briefly discussed are some of the best ones on the market atm. Grab one! Good article btw. very informative and interesting videos . I think the idea of convenience is going to play a big role in future suitcase development. Wow, whoever thought up this concept is a genius. I thought when suitcases came out with wheels it was great, but now somebody has taken it a step further. It will actually be quite amusing once this takes off to see everyone at the airport scooting around with their luggage. The airports will probably have to design mini roads to avoid people colliding with each other. Yes, definitely a genius idea. And yes, that’ll be interesting to see what changes will have to take place. There are also the other motorised bags that’ll follow you around, so they will have to adjust their “traffic rules” to all of that. Okay, I need scooter luggage in my life. What a terrific idea! I figured it would just be for kids, but when I saw there are adult ones, too . .. well, definitely going on my wishlist. I plan to travel quite a bit in the near future and a scooter bag would be perfect for traveling. I have to be honest here. I can’t imagine playing dodge’em with kids on these Scooter Bags if I’m trying to run for a plane, unless of course, I get to be one of those kids. LOL What a hoot! I can definitely see this catching on. FUNctionality. Love it! Well, some of them are for adults, so yes, you do get to be one of the kids! I LOVE the electric scooter. The price is a bit steep, but if you like to travel I think this is a pretty cool idea. It also charges fairly quickly and you can get far with it (7.4 miles). Can you also use it as a kick scooter? Will you be able to buy the batteries separably (for a spare)? I have a friend who is going to travel Europe next year. I think he would love to have one of these. Thanks for a great review and sharing a really cool product! Yes, you can also use it as a kick scooter and yes, you can get the batteries separately. Just follow the link. That is genius!! Why I never thought of this! I personally because of my job, use luggage every day but it gets annoying when you gotta drag that thing around. If I can scoot with that it will be so much fun instead of dragging a dead fish!. I see that the price is a little bit pricey so I gotta save up and will get one for sure!! Thanks for sharing this awesome product in my life! Yes, I love the idea of scooting around the airport myself 🙂 I’m sure the prices will come down with the technology becoming more common. With the Scooter luggage becoming more popular, I see people probably using this everywhere. At the office, going to meetings, and of course possibly as carry on luggage. Thanks for the tips on how to use these providing great photos and features as well as benefits of these durable roll along ride alongs. It makes it easier for me to imagine myself scooting along with one of those.